There are dozens of leaders to choose from every time you sit down to play a new game of Civilization V, each with their own sets of perks and bonuses. Some are good, some are OK, some are terrible, but only one is the overall best, and that leader is Elizabeth. The thing with most leader abilities in Civ V is that most are highly specific: they're generally only useful for players tackling a very certain type of game, have vague and unimportant bonuses or can only be used for a limited window of time. Gengis Khan's ability is only useful if you're attacking city-states (rarely a good idea), for example, while William's is so reliant on a single set of circumstances that it's rarely ever employed. Elizabeth, on the other hand, gets not one highly important ability, but two. It's almost unfair. The first is a whopping +2 movement range for naval units. That's all naval units, not just military ones. This is useful throughout the game, because your early explorers can use it to reveal your immediate surrounds quicker, while later explorers can navigate the world's unknown waters faster, giving England a huge advantage in the race for unoccupied islands/continents. This is a big deal because, on all but the smallest maps, those new lands (and the strategic resources they contain) can make the difference between winning and losing. In case that wasn't useful enough, the game's big expansions have given Elizabeth another helping hand: an extra spy. Normally, when you advance to the point where you can undertake espionage, you're given a single spy, and further agents are hard to come by. You'll spend centuries with only a handful of them. So, relatively, being given an extra one can again make a big difference, regardless of how you play, since you can use them for counter-espionage, diplomacy or stealing tech. I've always wondered why Elizabeth's perks aren't just more powerful, but more generally useful. Other leaders have occasionally rivalled her - Maria Theresa's ability to effectively buy city-states have broken many a game - but those instances are either down to that leader's specific ability meeting the specific set of circumstances in which they're useful, or have been nerfed by updates to the game. Maybe it's compensation for England's drab maroon colour scheme (Japan getting England's more obvious white + red combo), or a developer's not-so-secret love for Cate Blanchett's motivational speaking skills. 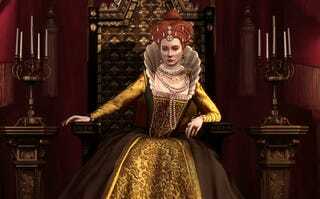 If you're new to Civ V, or just want to make use of the best all-around leader in the game regardless of what map you're playing on or how your game shakes out, you can't go past The Virgin Queen.